I was drafted into the Army in June 1941 and assigned to the 298th Infantry Regiment G Company camped at Waimanalo on maneuvers, but on the morning of December 7 we noticed smoke rising from Kaneohe Air Base. A plane with a red “hinomaru” beneath its wings flew over. We thought it was just maneuvers until the machine gun firing started near Bellows Airfield. Then we knew it was for real. We received orders immediately to dig gunpits and foxholes along the shore, and rotated guard duty, waiting for the Japanese invasion. On December 8 my blanket was used to cover a dead crewman from a Japanese midget submarine that ran aground on Waimanalo beach. Lieutenant Sakamaki told Sergeant Akui in English, “I am cold,” but he wouldn’t say anything either in English or Japanese. A few months later, the Army authorities recalled all 298th soldiers of Japanese ancestry to Schofield and assigned us to a Provisional Infantry Battalion, which became the 100th Infantry Battalion. In June 1942, the Battalion shipped out to Camp McCoy for combat training. I became a platoon sergeant. Within a few months, the War Department conducted an intensive search for translators/interpreters for the Pacific War. MISLS recruiters came to McCoy to interview men of the 100th. Since I had finished “kotoka” at Makiki Japanese School and had graduated from both Waseda and Meiji Universities just before World War II, I was included in the first call. Since I wanted to stay with the 100th, I refused, but I was told that I will be sent to MISLS; so, I accepted. At Camp Savage I became barracks sergeant and was assigned to Section 6 where I graduated with the “Best Soldier” award. Around August 1943, some of us were asked to volunteer for a special secret and dangerous mission having less than a 50-50 chance of survival. 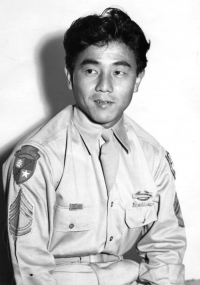 I volunteered and found myself a part of the 5307th Composite Unit Provisional, later known as “Merrill’s Marauders.” First Lieutenant William Laffin led a team that included Howard Furumoto, Robert Honda, Russell Kono, Ed Mitsukado, Herbert Miyasaki, Roy Nakada, and seven other kotonks. The troopship Lurline took two months to reach India, stopping in Australia to pick up a battalion of Guadalcanal infantry veterans. Merrill’s Marauders were the only American infantry forces at that time in the Burma campaign under General Joseph Stilwell’s command, given the special mission to conduct flank and encircling attacks against the Japanese 14th Army to support frontal attacks by the Chinese army. In February 1944, General Stilwell ordered the 5307th (code name “Galahad”) to march from Ledo, India, into the Japanese-occupied Hukwang Valley in Burma, over 750 tortuous miles of mountainous jungle terrain to reach the final objective, Myitkyina. On March 4, 1944, the Marauders engaged in their first battle by attacking Walawbum, where I remember we killed all of a 10-man Japanese patrol. I was ordered to eavesdrop on the Japanese troops from across the river and a haole officer was good enough to accompany me for my protection. I recall making night reconnaissance trips without lights to guide us, seeing only the luminous patch on the back of the soldier in front. We failed to take any prisoners or retrieve any documents; so, there was little language work for us at Walawbum. Marching south from Walawbum, I developed a severe case of hernia from the long arduous march until I could hardly walk. An officer offered me his horse which didn’t help any, but for the best relief, I hung on to a mule’s tail and let the animal pull me along. Finally they evacuated me by plane to the 20th General Hospital at Ledo for surgery. At the hospital, I interviewed Japanese “comfort women,” Korean girls. I also interrogated about 25 Japanese POWs including one woman nurse, but could not obtain any useful military information from them. Being hospitalized for several months, I missed the fighting at Shaduzup and Nphum Ga (Maggot Hill), where the Marauders suffered heavy casualties. Around May 1944, General Stilwell was desperate for more American troop support for the battle of Myitkyina and I was flown back to Burma to rejoin the Marauders just in time for the great battle for Myitkyina. By then the Mauraders were sorely depleted in ranks from combat casualties and sickness and totally exhausted from successive campaigns without rest. While in Burma I suffered a total of 11 malaria attacks. At Myitkyina I joined Eddie Mitsukado, who headed all Marauder Nisei linguist, in translating, interrogating, doing live as well as wire intercept work, trying to learn Japanese troop tactics and movements. I was sent to see a Chinese General, although I was just an enlisted man, to request all captured Japanese documents to be turned over to General Stilwell, commander of the Burma-China campaign. The battle for Myitkyina raged for over three months after the Marauders had captured the vital Myitkyina airfield. The Japanese waged fanatical counter-attacks and doggedly defended the town until the 18th Division finally retreated in defeat southward on August 3, 1944. The Marauders had suffered more than the predicted 75% casualties and disbanded after earning a Presidential Unit Citation. Although all 14 Niseis survived, many were hospitalized and I returned to base camp in India, where I, too, was hospitalized for malaria. With all my points, I was one of the earliest to be rotated to the U.S. for my discharge. This article appeared in the Military Intelligence Service Veterans Club of Hawaii’s 50th Anniversary Reunion booklet, printed in July 1993.